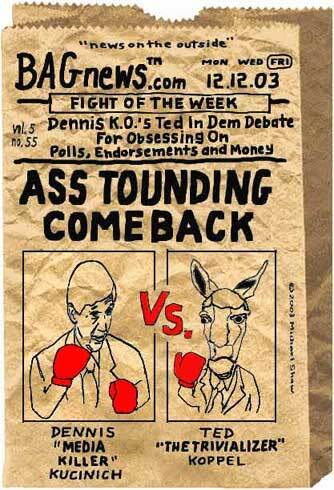 Fight of the Week: Dennis “Media Killer” Kucinich Versus Ted “The Trivializer” Koppel. Does anyone really think that Kucinich stands a snowball's chance? Kucinich is a joke. Anyone that supports him is a joke. Anyone that campaigns for him is a joke. And anyone that votes for him is a person of subnormal intelligence. But by all means. Throw your vote away! They will Welstone him if he ever does manage to climb out of the media black hole. 2. Dennis "Mind-Control Satellites" Kucinich has not a single shred of hope of EVER appearing on this nation's political consciousness...unless he snaps completely (and that's not too far away) and tries to assasinate someone to impress Jodie Foster. Kucinich is probably not running to be president, but his presence is important all the same. All voices across the political spectrum must be heard. We've had members of the right wing ruling us for four years, and they are the biggest jokers on the face of the earth--I say let the working class's voice be heard too. Except the lunatic fringe. The kind of sandal-wearing "peaceniks" who are all rooting for the Iraqi so-called resitance.